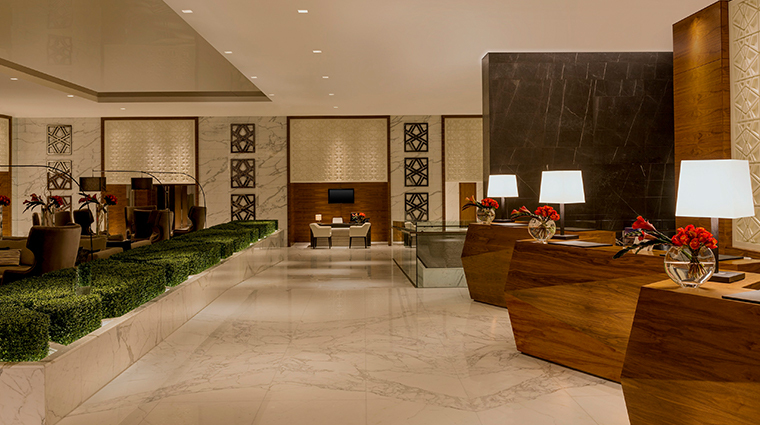 Walking into Sheraton Grand Hotel, Dubai in the heart of the city’s financial district is like stepping into an uber-stylish oasis of calm. The bright lobby, with its comfortable black sofa, cluster of light bulbs in inverted glass bottles, and chic corner café, buzzes with suited businesspeople and smartly dressed couples. 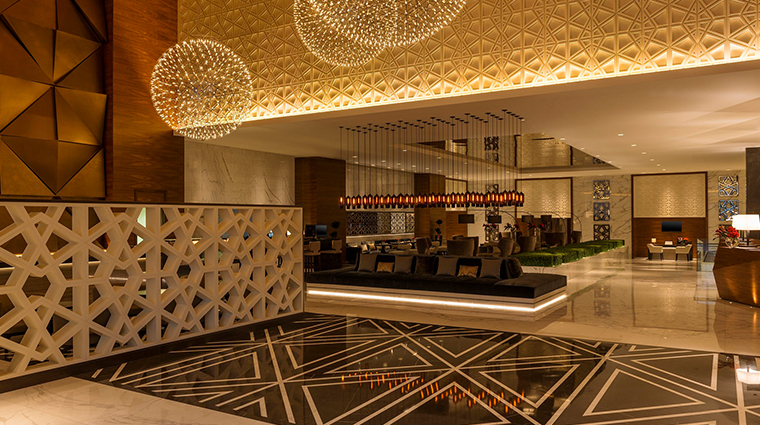 The Arabian design influences are subtle but significant: a framed black-and-white image of a desert dune, a traditional coffee pot at the welcome desk and a white mosaic that reminds you of the windows of heritage houses. 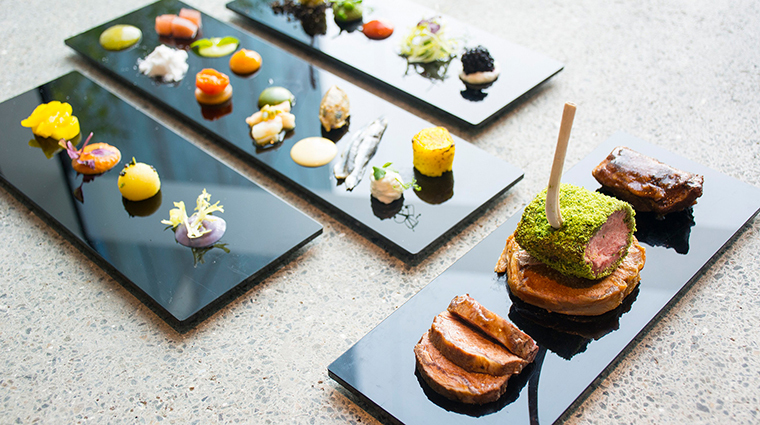 When it comes to food, the Sheraton goes global in is offerings. Choices include a jazzy New York City-inspired spot, a Jamaican restaurant with a reggae soundtrack and a lobby café with specialty coffees from around the world (try the Vienna mocha). The location on Sheikh Zayed Road is a five-minute walk to the World Trade Center metro station. 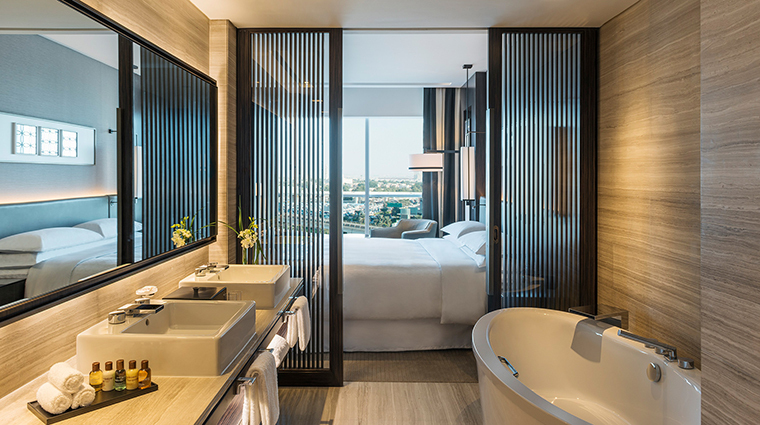 Downtown Dubai and Dubai International Financial Center are a stone’s throw away, making this hotel a good central choice for both leisure and business travelers. 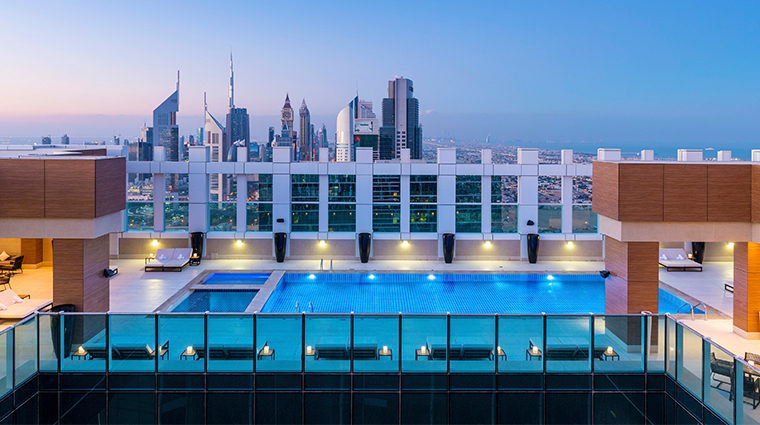 Don’t miss the rooftop poolside bar Dawn & Dusk, on the 54th floor, for a cocktail and shisha over spectacular sunset views of the Dubai skyline. 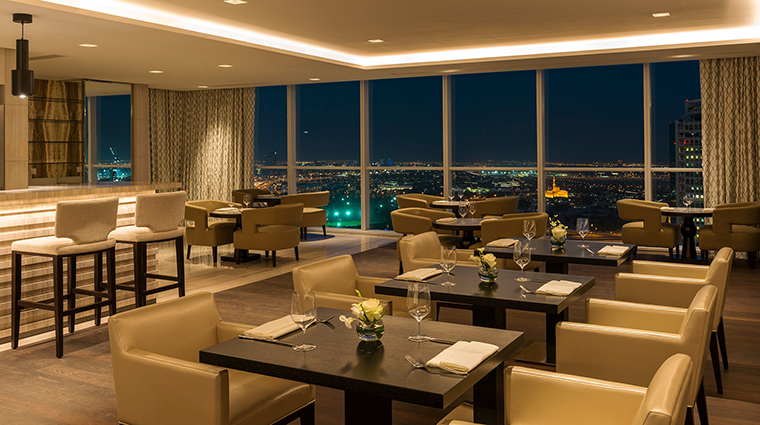 Staying in a Club Room grants you access to the Sheraton Club Lounge, an exclusive space where you can enjoy complimentary breakfast, afternoon hors d’oeuvres and happy hour in the evenings. 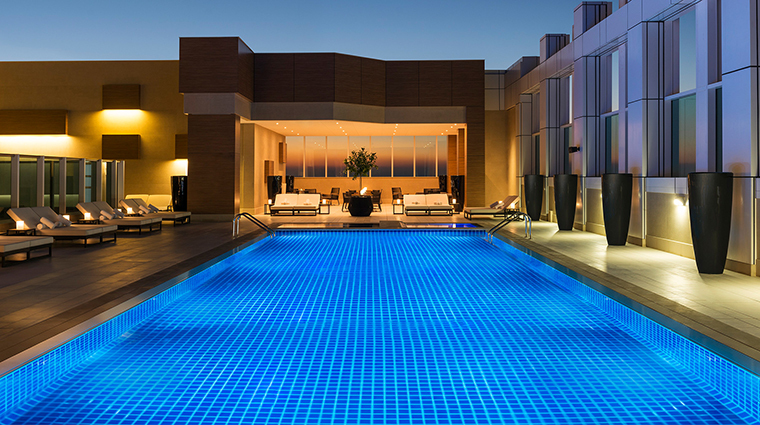 Shine Spa offers a peaceful atmosphere where you can unwind after a day out in the desert sun. A steam room, sauna, Jacuzzi and ice fountain, separate for men and women, are available in addition to the wide array of treatments. 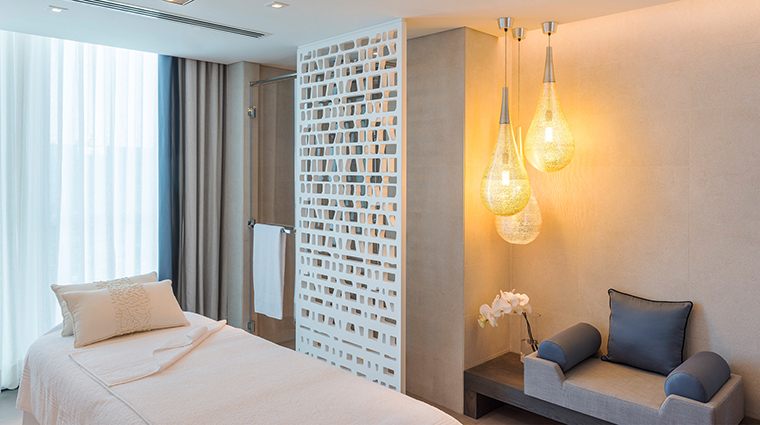 The modern, stylish guest rooms also provide a spacious, soothing respite — especially the custom-made beds. 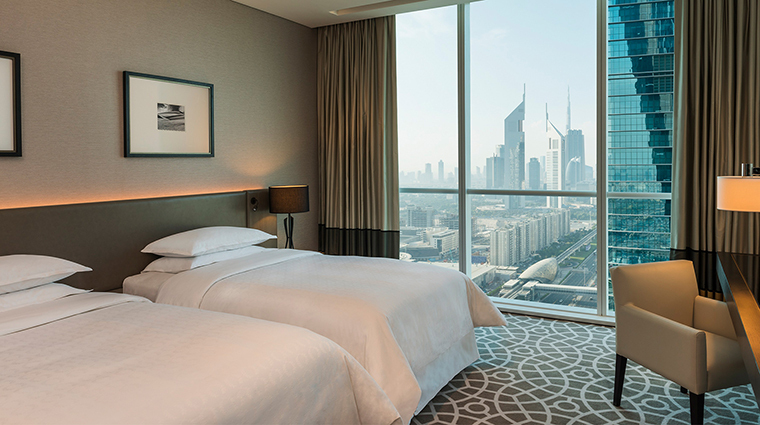 Ask for a room with a view of Sheikh Zayed Road. The aerial view of fast-moving traffic on the arterial road is curiously therapeutic. 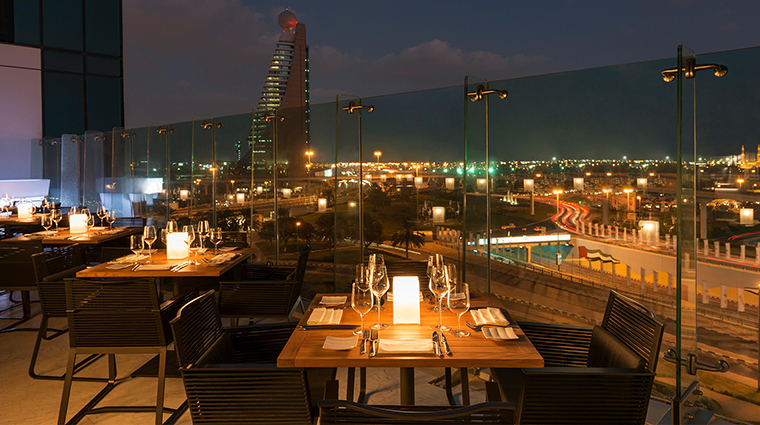 The city’s best restaurants, bars and clubs are located along the same road as the Dubai hotel, so you’ll have plenty of options, should you want to try something other than the property’s venues. Due to its proximity to the World Trade Center, the hotel can get busy during trade conventions, so book well in advance. 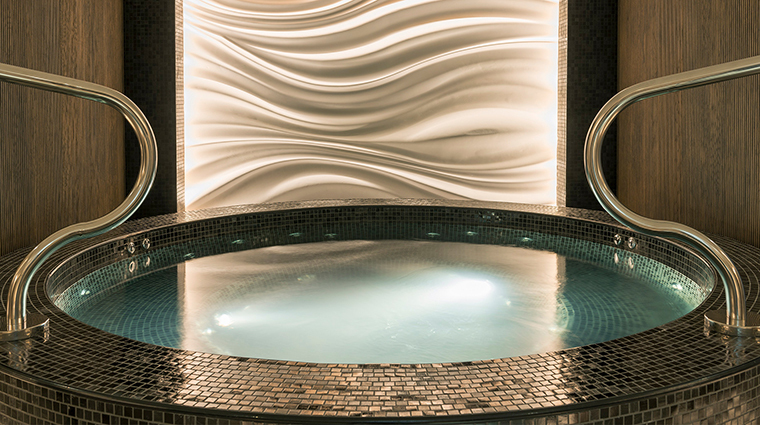 For couples looking for some quiet, the Shine Spa offers a Private Spa Suite featuring its own whirlpool, shower and bathroom. 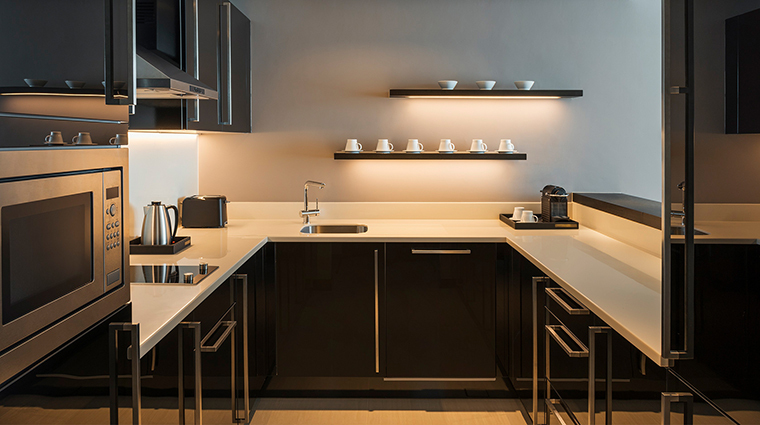 The modern but minimalist rooms are bright with the soothing color palette of black, white and gray, with the occasional hint of purple and ochre. 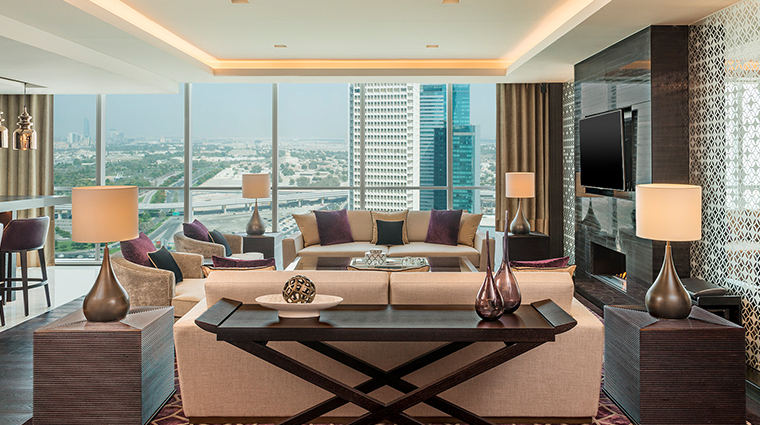 The framed artwork adds an Arabian touch while floor-to-ceiling windows let in natural lighting. 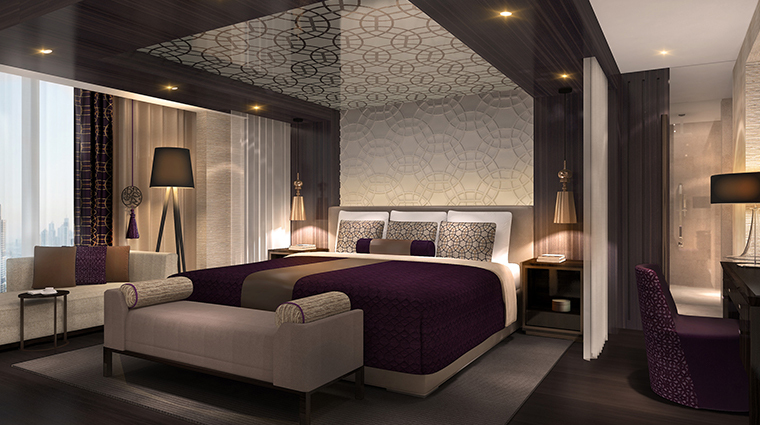 Luxurious king beds and plush living areas promise a comfortable home away from home. 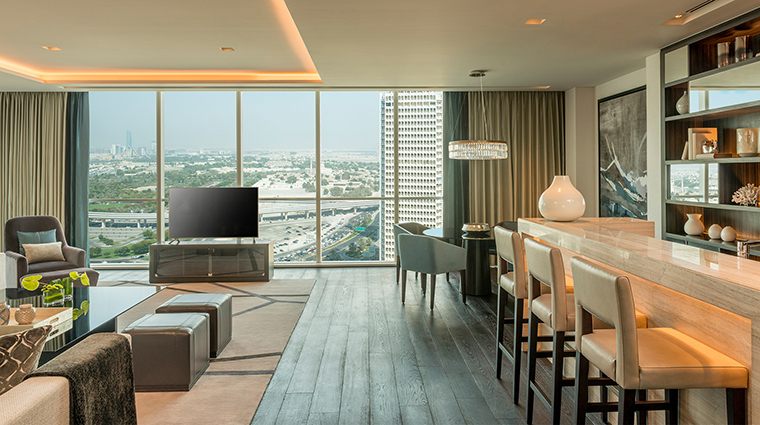 Each room comes with a sleek 42-inch LED TV, work desk, Nespresso machine and complimentary Wi-Fi. 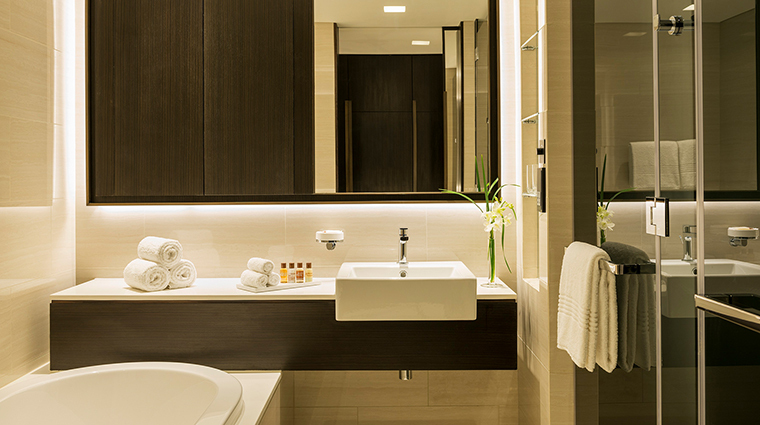 The luxury hotel provides spacious guest room bathrooms fitted with large bathtubs and separate rain shower cubicles. 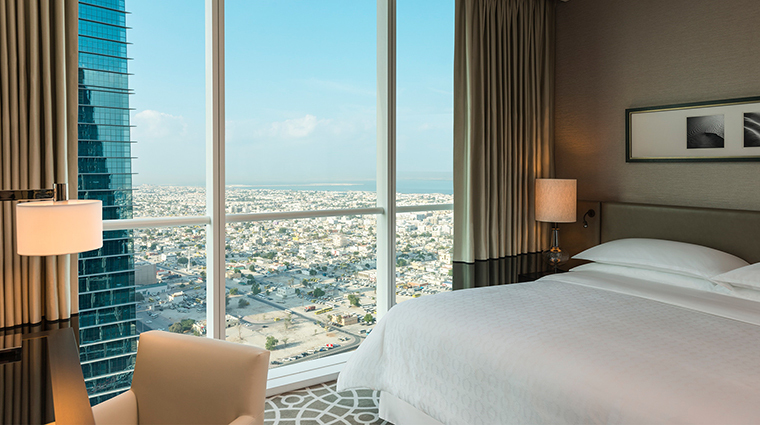 As part of the Sheraton Signature Sleep Experience, all rooms feature especially comfortable beds designed to improve circulation. Be sure to peruse the extensive pillow menu. 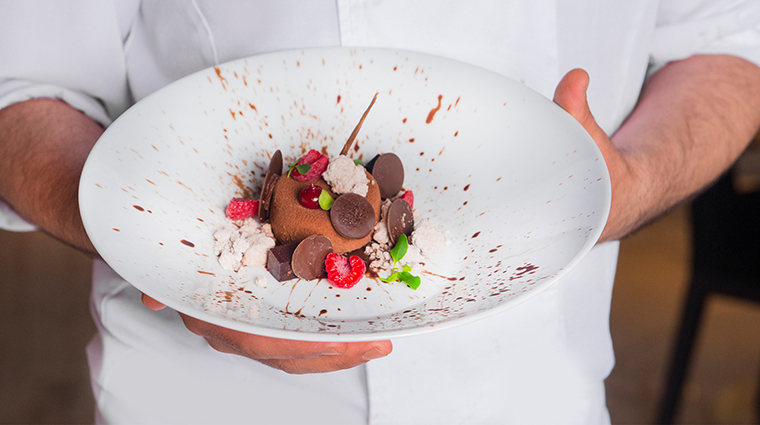 The family-friendly restaurant Feast features live cooking stations serving artisanal specialties from different global cuisines. 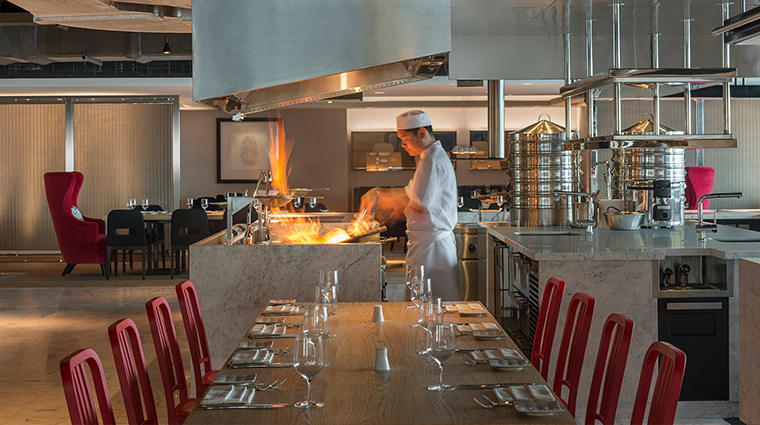 For an intimate celebration, a very special private table is available with its own kitchen and dedicated chef. Feast also hosts promotions six nights a week featuring various cuisines, such as a seafood-themed menu or Mediterranean bites as well as a leisurely Friday brunch. Moe’s on the 5th is Dubai’s new hub for jazz, soul and funk. Enjoy unusual signature cocktails such as Cabaret (made with star anise), wine and charcuterie selections, and mains like seafood risotto and lobster linguine. Also available is an lengthy cigar menu. NYC export Miss Lily’s offers a taste of Jamaica in Dubai serving up traditional island dishes like jerk chicken and curried goat. Thanks to the reggae tunes, island-style cocktails, quirky décor and modern take on Jamaican cuisine, Miss Lily’s gets busy, even on weeknights. The party gets started post 9 p.m. and the dress code is relaxed.